Cultivated in the gardens of Asia for centuries before coming to Europe and the United States as an import from the Orient, the camellia is a flower steeped in history, culture and amor. With the commercially important Camellia sinensis grown for tea around the world, the ornamentally spectacular species such as C. japonica and C. reticulata have found their way into gardens around the globe and into flower shops near you. Blooming at their brightest in December when the days are short and the nights are long, thousands of different cultivars of this winter bloom have appeared in everything from artwork to operas over the century and carry with them the message of adoration and affection. First grown in English gardens in the 1700’s after being imported from tea ships coming from China, several different species of camellias were bred for new colors and larger sizes. The ornamental varieties come in reds, pinks and white and are double-petaled. The rose-like arrangement of petals spring open from perfectly round, green sepals that look like ornaments along the woody branches of shiny, green leaves. The plant itself is grown as an evergreen shrub in warmer climates that is prized as much for its glossy foliage as its winter (and sometimes spring) flowers. The flowers are trimmed and sold by florists to use in arrangements and bouquets. They make exceptional corsages and flowers for the hair, making them an excellent pick for winter weddings where their pure white petals or deep red rose-like blooms stand out against evergreen sprigs and backgrounds of snow. 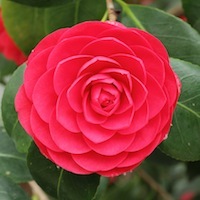 In East Asian symbolism, the camellia was said to represent “perfect love.” In the Victorian language of flowers, the message conveyed by this bloom was based on its color. White was said to symbolize “adoration,” while white meant “longing” and red was used to tell someone that they were the flame of your heart. Considered the ultimate flower of luxury, camellias occupied a fame similar to orchids these days and were depicted in paintings and poetry from the likes of Waterhouse and Tagore and were even the inspiration for a play by Alexandre Dumas, later transformed into Verdi’s, La Traviata. Camellias are a wonderful choice for expressing affection and adoration in the wintertime. Anniversaries, engagements or any occasion to let someone know they warm your heart during these chilly winter days are easily expressed with this flower.